This past weekend I got my hair blown out because it was time for a trim. I have not had my hair professionally straightened and trimmed since November of last year! I know that’s shocking to some, LOL! My birthday is Friday and I wanted to let my hair down! I visited The Chicago Curl Collective, and Daria laid her hands on my hair. I have A LOT of hair! When it comes to straightening it, that is one job I do not tackle on my own. Daria and I began to talk about the benefits of steaming your natural hair, and why you should add this step with your deep conditioning to your regimen at least once a month. I learned some valuable information about steaming that I wanted to share. I think it is very beneficial and can help your hair in many ways. I am all about having not only bomb twist-outs (lol), but overall health hair. Steaming your hair helps to replenish what may be sucked out during our every day routines. Steaming also helps aid in greater moisture retention, which is very important. Steaming allows for deeper penetration into the cortex of the hair strand and you’ll see an overall improvement in pliability and elasticity of the hair strands (ability to manipulate and stretch the hair strands without them snapping off and breaking) as well as an increase in hydration. When rinsing the conditioner from your hair you will want to make your water as cool or as cold as you can stand it! This is a step that I fail to complete sometimes, but it is very important! Doing this after steaming helps close the cuticle layers back down and seals everything in. BOOM! The greatest benefit is that steaming is 5x’s more effective in restoring moisture to dehydrated hair than conditioner only or even conditioner and sitting under a hooded dryer. And that ladies, is awesome sauce! I have a handheld steamer that I LOVE (Q-Redew), I am also looking into purchasing a standing steamer like the ones used in professional salons. I just love the way my hair feels when I steam! Rejuvenated and ready to conquer the world! 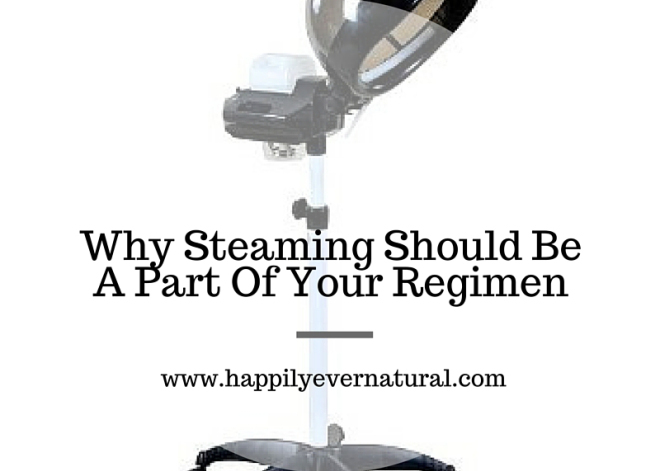 Do you use a steamer? Do you think it helps your hair in any way? Thoughts?